White Dee says she’s broke and might lose her house! 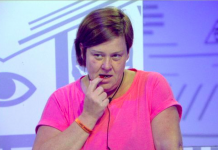 Reality TV star White Dee has said he's officially broke and may lose her house as a result of it. Celebrity Big Brother 2014: Gary Busey and White Dee row! The argument started when Dee claimed that Gary was taking the show too seriously, using the example of when Gary stormed off to the diary room.